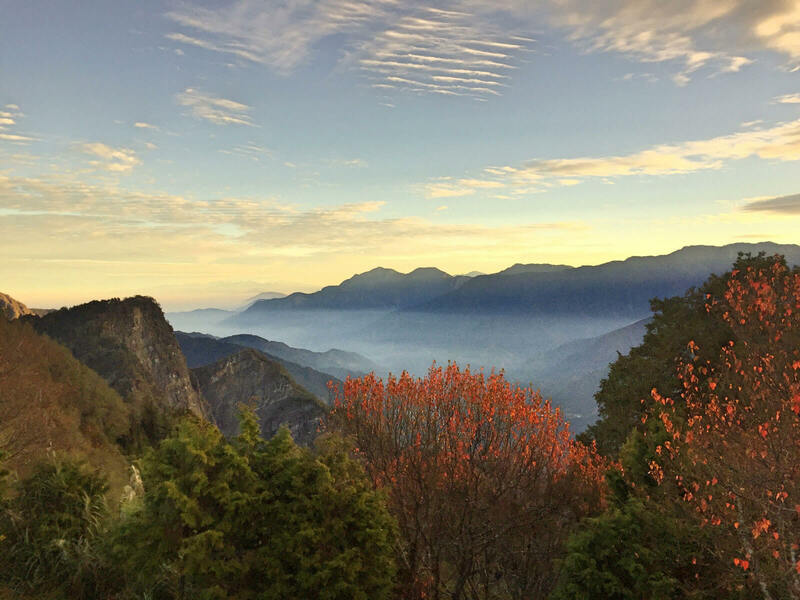 Little slivers of light begin escaping from behind tall peaks until the whole mountain range gets bathed in the golden early morning rays of the famed Alishan sunrise in Chiayi County of Taiwan. 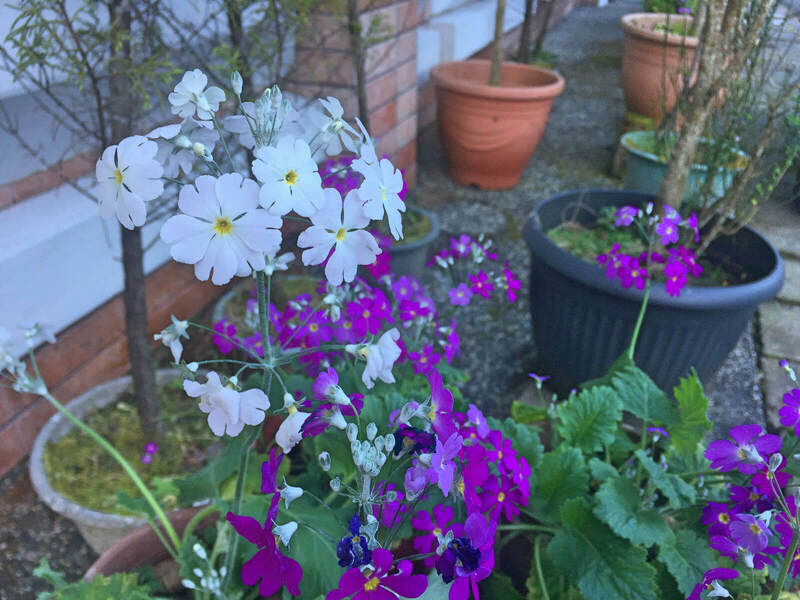 Soft waves of white that go on as far as the eyes can see decorate the hollows between mountaintops and form the sea of clouds that is another popular attraction in the Alishan National Scenic Area. A vantage spot over 2,600 meters above sea level, way higher than the clouds in fact, is the best place to enjoy these two natural attractions. GLORIOUS SUNRISE. 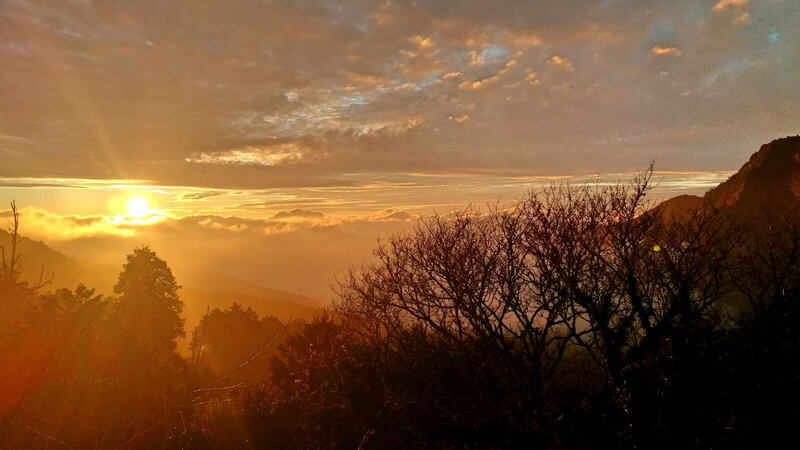 Alishan offers a fantastic view of the sunrise. 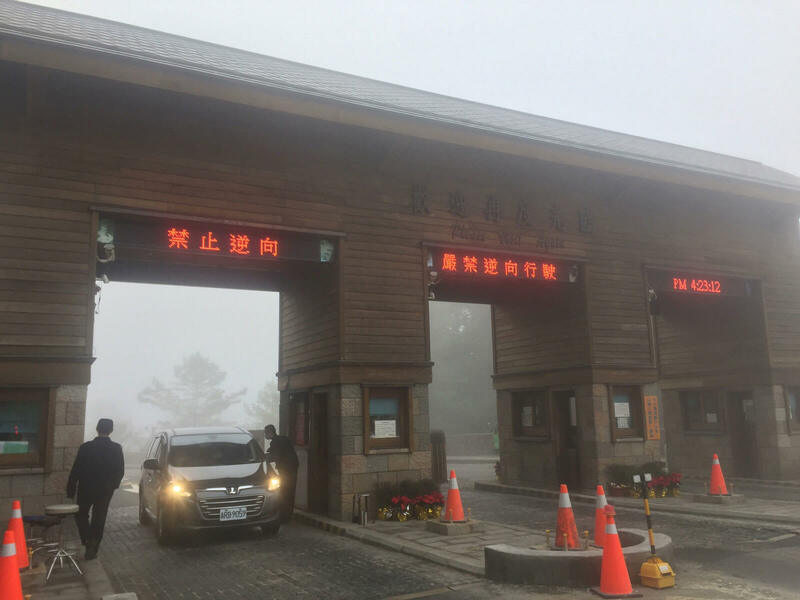 It’s called the Chushan viewing point and getting there requires an intricate combination of transport services, including rail–regular or high speed, bus or taxi, and forest train. 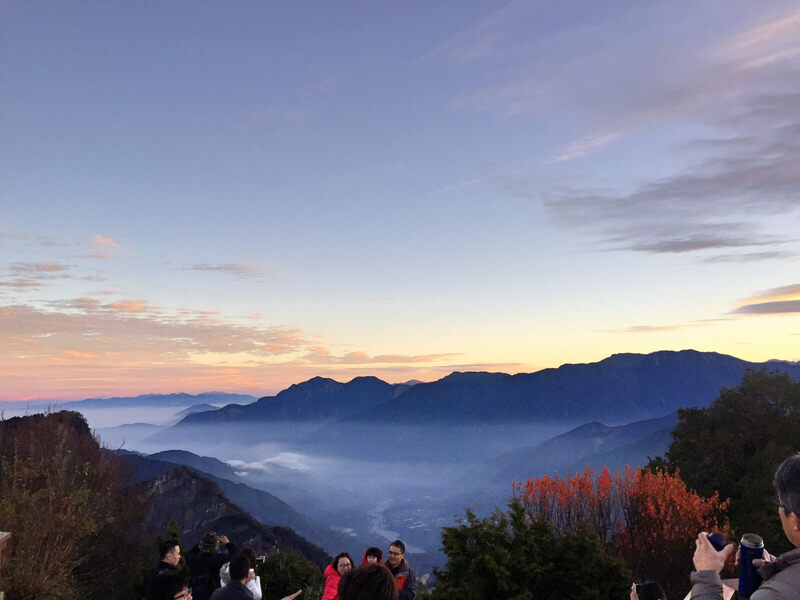 Catching the glorious Alishan sunrise involves waking up in the wee hours to line up for the train to Chushan and do a bit of walking to the best viewing spots. 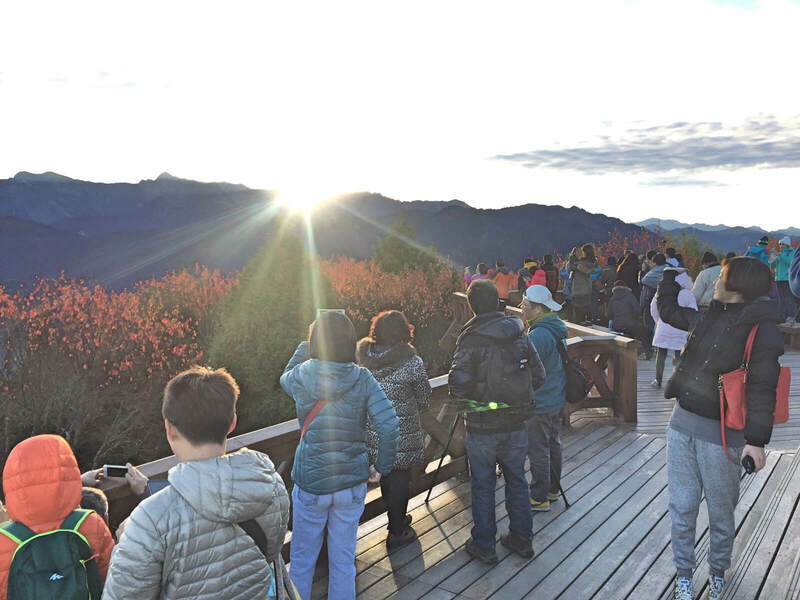 Many people will jostle for a space at the main viewing deck right at the Chushan stop but there are two other areas where you can watch the sunrise. The first will involve walking back for about five minutes from the train station while the other involves a forward and mostly uphill trek of around 15 minutes but the view is better and makes up for the slightly challenging climb. If your main objective is to experience the sunrise and sea of clouds, you must make arrangements to stay overnight. Better yet, stay two nights or more. 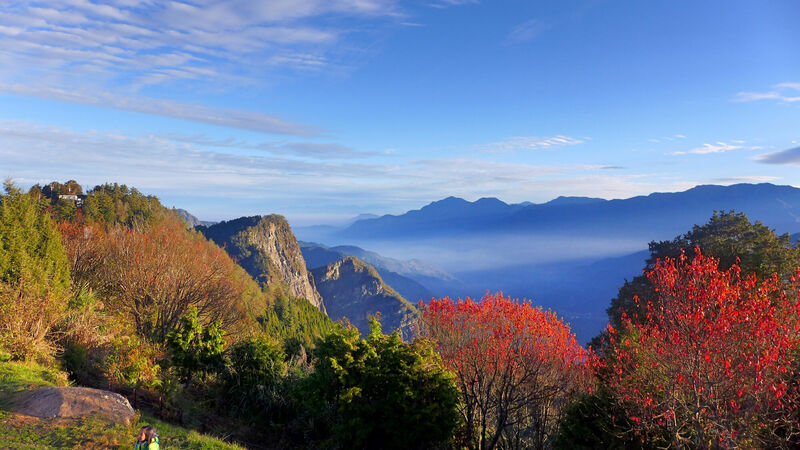 The Alishan National Scenic Area covers over 40,000 hectares of woodland, uphill and downhill trails, ponds and waterfalls, temples, as well as local restaurants and tea houses. One full day isn’t enough to enjoy the many attractions that this park and nature preserve has to offer. 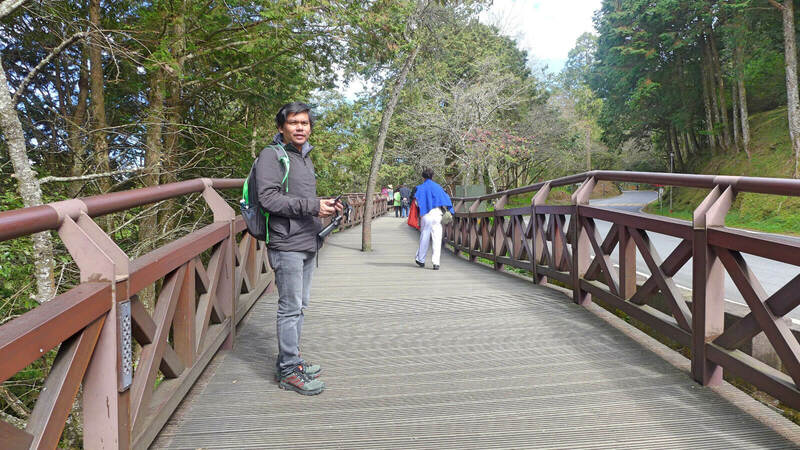 ALISHAN CENTER. This is the center of the township, the start of your nature trek and the station for the trains that lead to the sunrise viewing decks. The 711 you see in the photo is the bus stop and ticketing office. 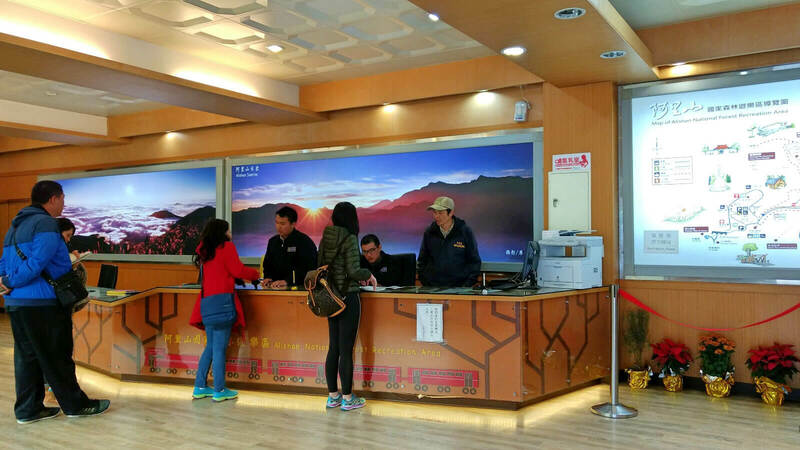 The best hotels will be those close to the Alishan township center, located within Zhongzheng Village and the last stop of the bus from Chiayi. 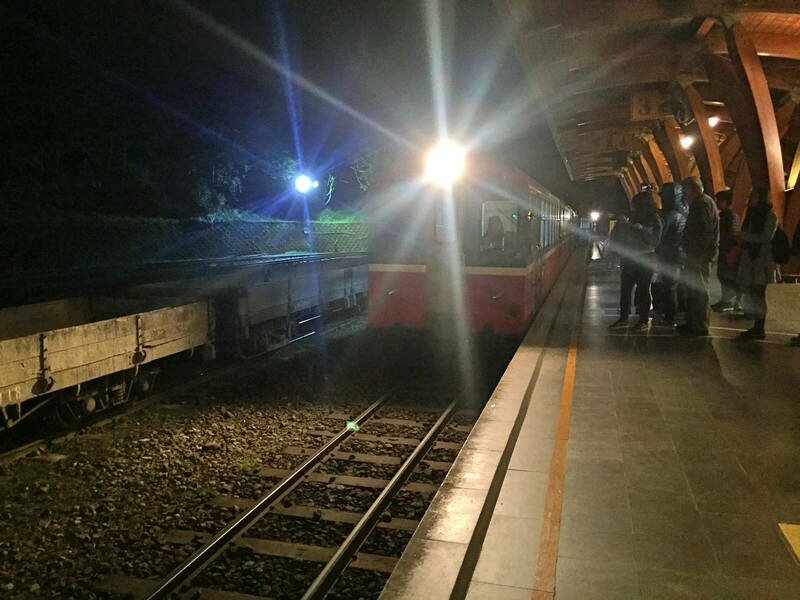 It is from here, specifically Alishan station, that the Chushan line starts its twice daily morning trips for visitors clamoring to watch the sunrise. The forest recreation area, which serves as entrance to the park’s walking trails, as well as visitor and other facilities can also be found here. DELICIOUS MEAL. We loved this deep-fried mushroom and oyster, stir-fried beef and green peppers and pork ball soup served in Shan Bin Restaurant at the village center. 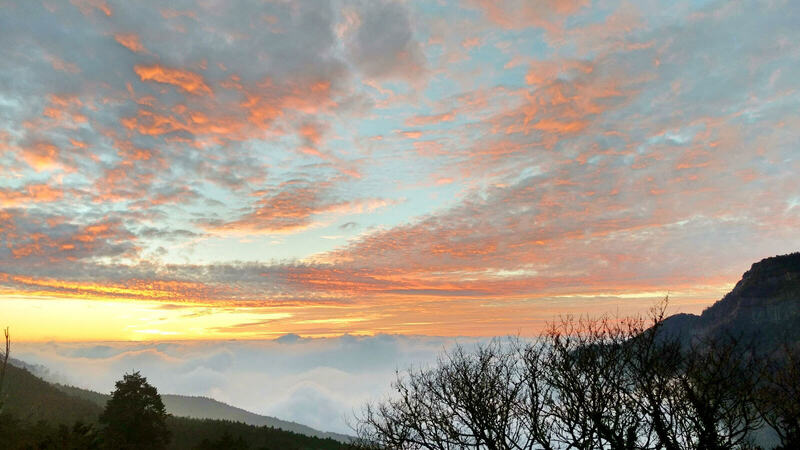 I found the Alishan sunset, though not as well promoted, to be even more spectacular than the sunrise. 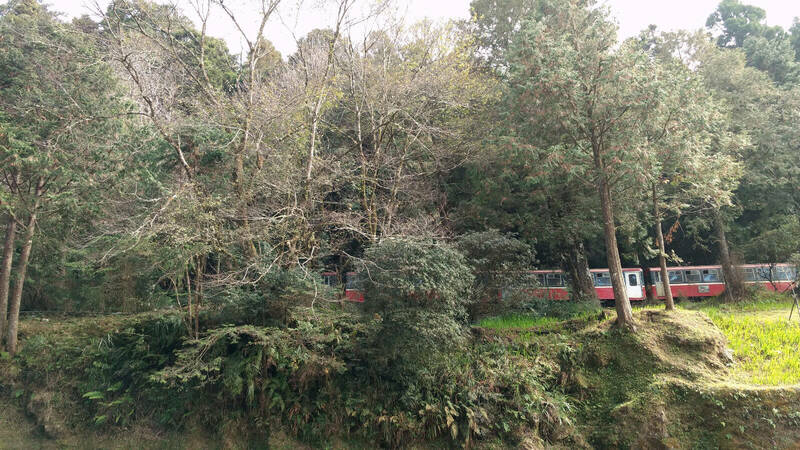 It didn’t come up in my research into Alishan attractions and we learned about it quite by accident. While following the trail to the sacred tree and Cihyun temple, we came upon a sign that said the sunset was best viewed from that vantage spot. It was still early afternoon so we decided to continue exploring the park’s well-marked trails and just return to the area when it was time. It was overcast and I wasn’t hopeful about the sunset. When the time came, however, the sun shone through and turned the heavens into warm shades of gold, orange, and red before disappearing beneath clouds and mountain peaks. NATURE TRAIL. 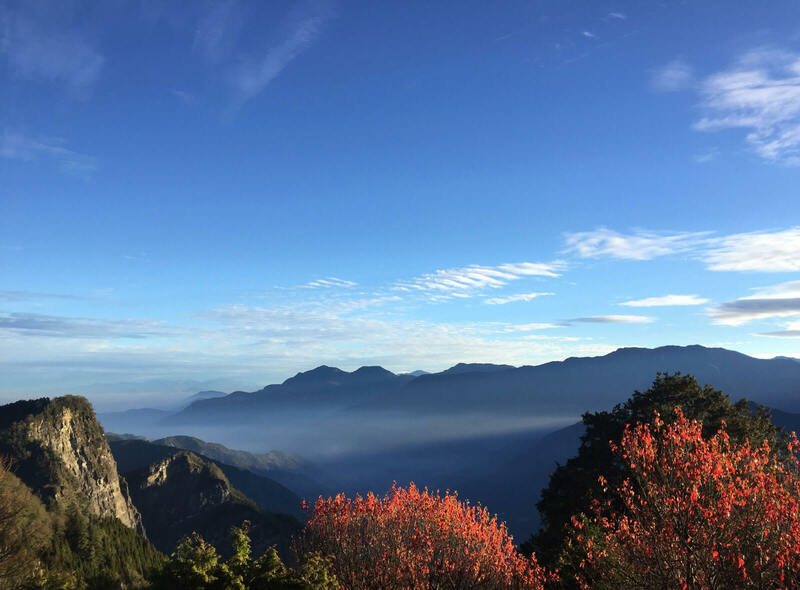 Walking the trail at the Alishan park is an easy although at times challenging trek amidst beautiful vistas, fresh air and a peaceful space. During months when the cherry trees bloom, however, the area is packed with tourists. 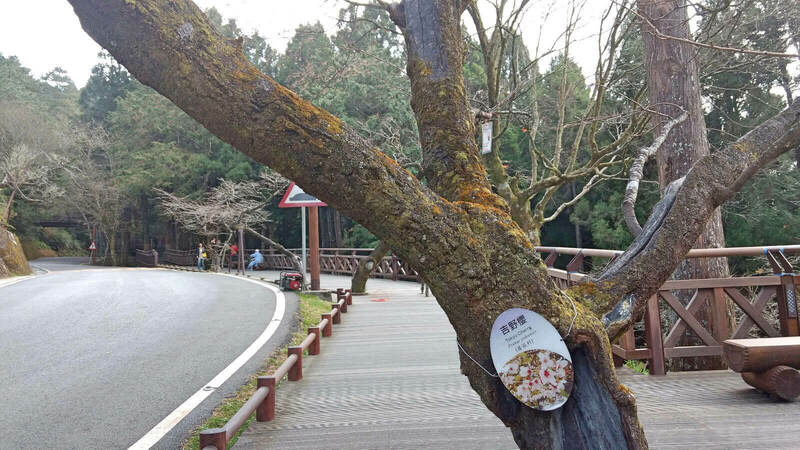 The Alishan walking trails are well-marked and connected so you will always find your way back. They lead to interesting sights and structures — through bridges to temples, waterfalls, strange trees, and even to twin ponds with a sad story to tell. 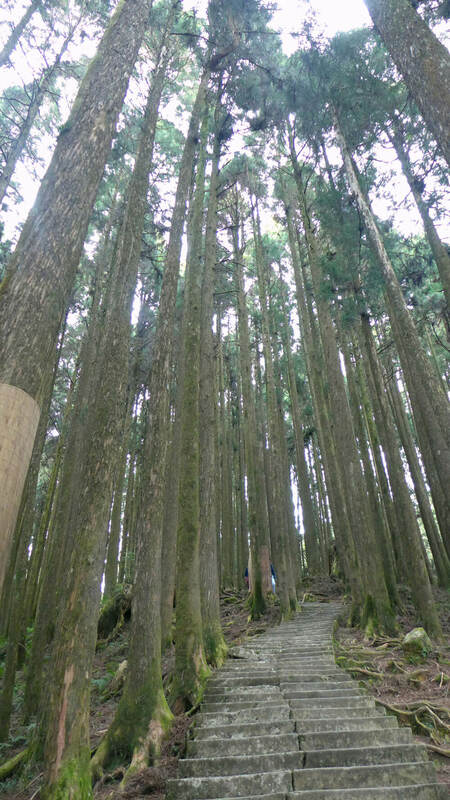 The trails sometimes wind through a thicket of tall cypress trees but they always lead to the main road inside the Alishan forest recreation area so there is little chance of getting lost. What you shouldn’t miss inside the recreation area are the Cihyun Temple, sacred tree (giant of a cypress), Big Sister Pond, Little Sister Pond, King Cherry, Zhouzhen Temple. The signs will point you to many more: three-generation tree, another that’s shaped like an elephant head, even cherry blossom trees. 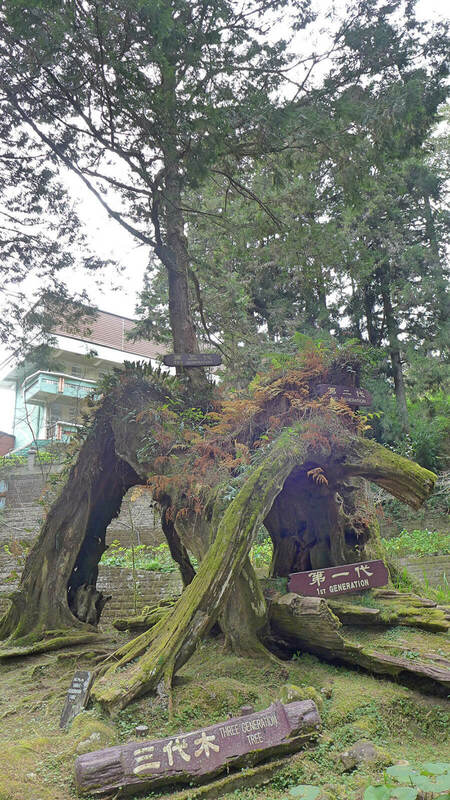 The Alishan Sianglin Sacred Tree. All that walking will definitely make you hungry but Alishan has you covered. 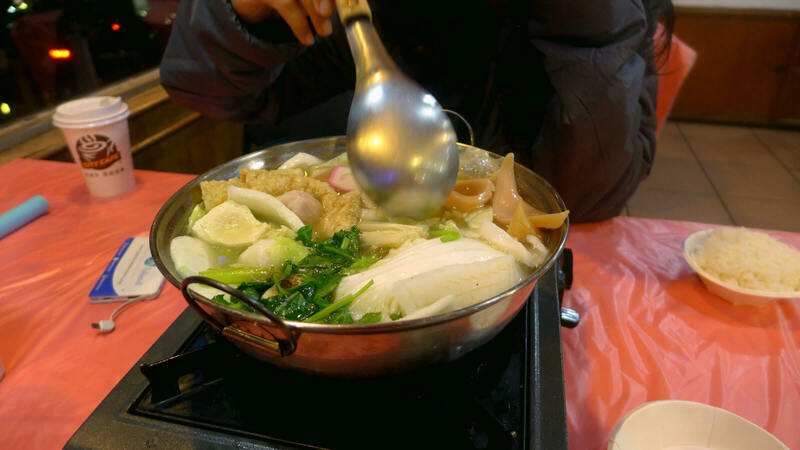 Almost all dining facilities within the township center serve the hotpot, a popular choice of visitors especially during the colder months from December to February. We chanced upon a local restaurant just across the forest recreation area entrance that served delectable fare. 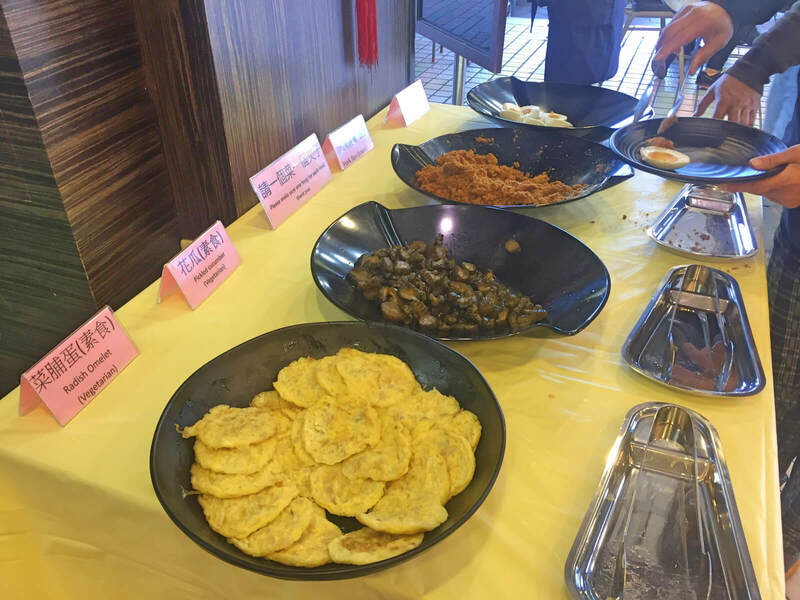 One of the staff was very helpful and suggested some bestseller dishes: miso soup, deep fried mushrooms and oysters, stir-fried beef with bell peppers, diced chicken with peanuts and chili. Her choices were always spot on. The vegetables are grown in nearby farms so they’re always fresh. Within the township’s business district, there were two 7-Eleven branches. They serve snacks and hot meals, too. 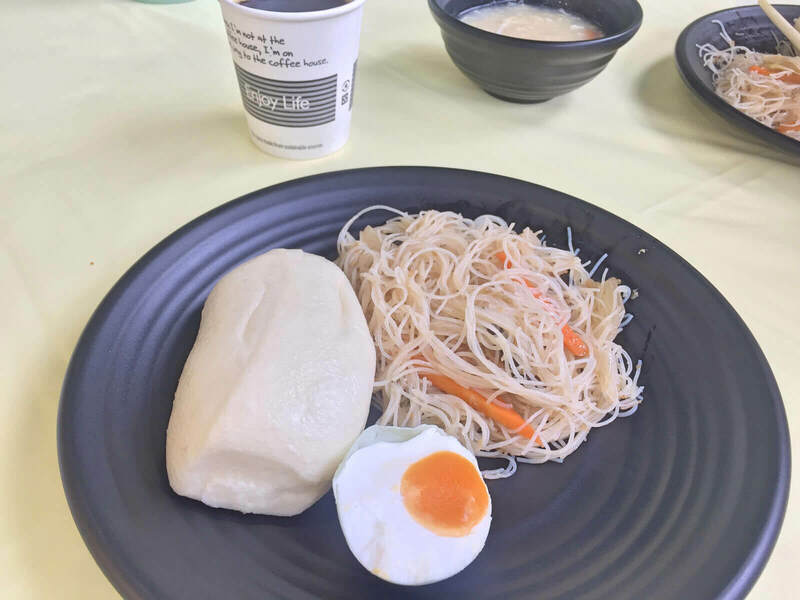 Your food cravings are always satisfied, whatever time it is in Alishan. 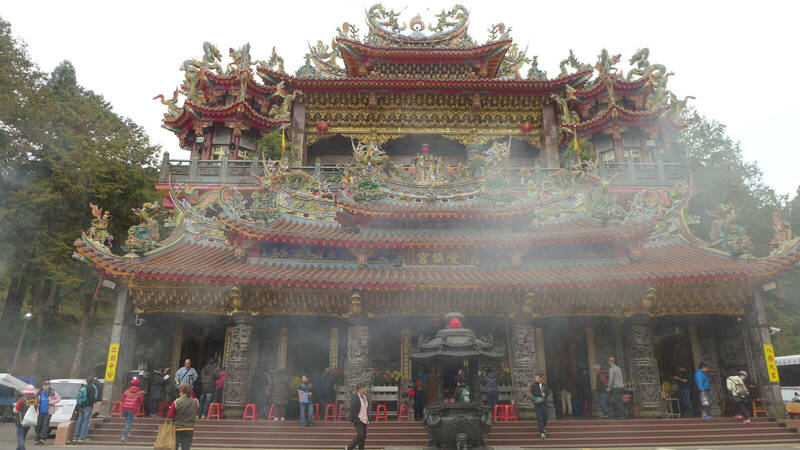 Alishan is also known for its high mountain tea so don’t miss a cup or two at the local tea houses while you’re there. Better yet, bring some home with you. 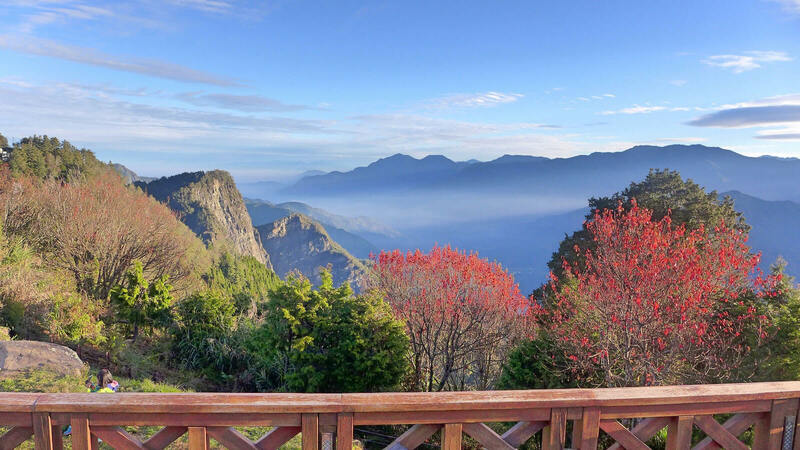 The next best thing to being in Alishan is reminiscing, and what better way to do it than in between sips of high mountain tea. 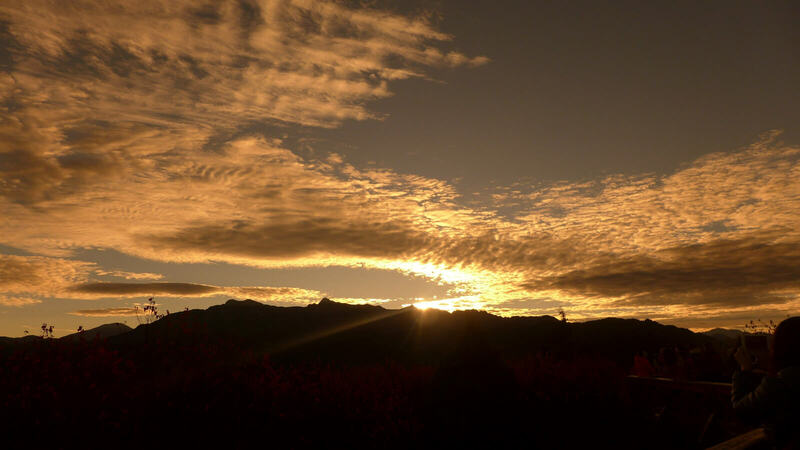 ALISHAN SUNSET. The sunset is as stunning as the sunrise and is best viewed on a deck near the Cihyun Temple. Do you want to fly to Taiwan? Philippines AirAsia flies the Cebu-Taipei route every Wednesday, Friday, and Sunday. Zhouzhen Temple. The prayer chants reverberate throughout the forest. 3 generations of trees are growing on top of each other in this part of the park. Bun, salted egg, and fried noodles for breakfast. Other breakfast choices are radish omelette and pickled cucumber. Cherry trees of Alishan. Our guide book says that the Japanese cut down the cypress trees in Alishan during their occupation and planted cherry trees such as this one. When the trees bloom, the placed becomes crowded with tourists, mostly from the mainland. This is supposed to look like an elephant’s head. 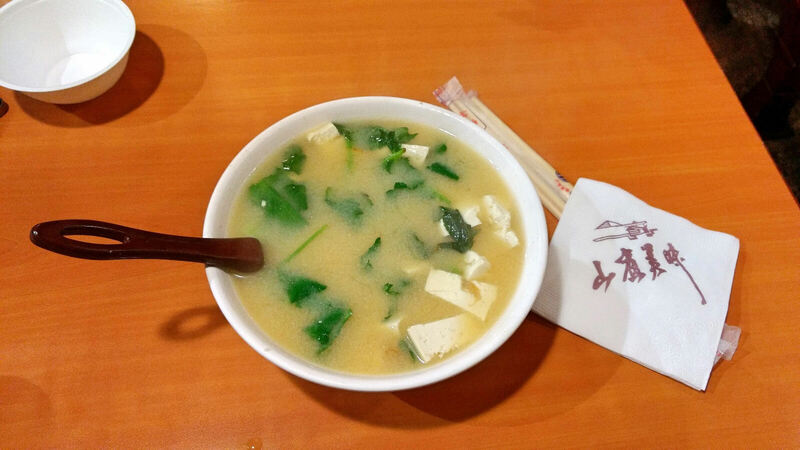 Miso soup – this was a yummy treat after a day and evening of walking in the cold. The steep path leading to the 2 sisters pools. Hotpot. This dining mainstay was our dinner on the first day. 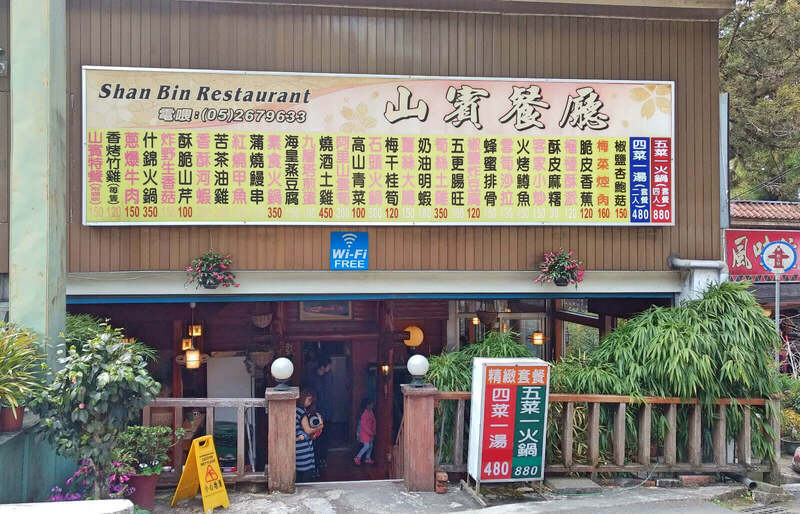 SHAN BIN RESTAURANT. We loved the food in this restaurant, where the staff was very helpful in helping 2 of the very few people who did not speak Chinese in the town choose from the menu. The sunset is as spectacular. Unlike the sunrise, only a few viewed the sunset. 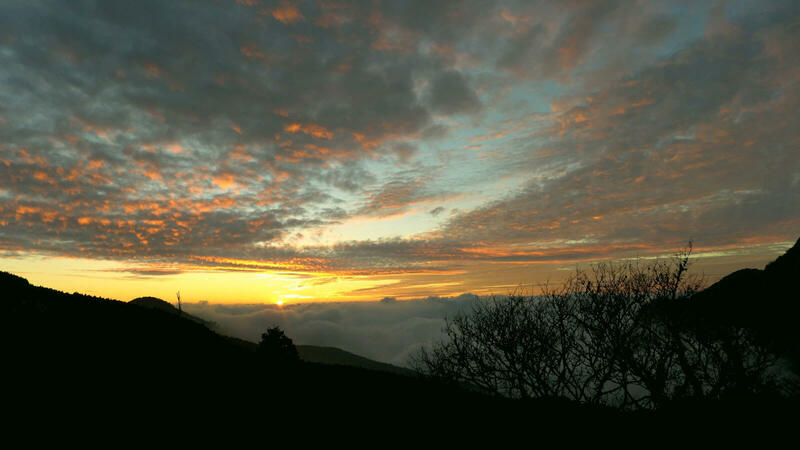 The sun sets on a sea of clouds in Alishan. Selfie spot. 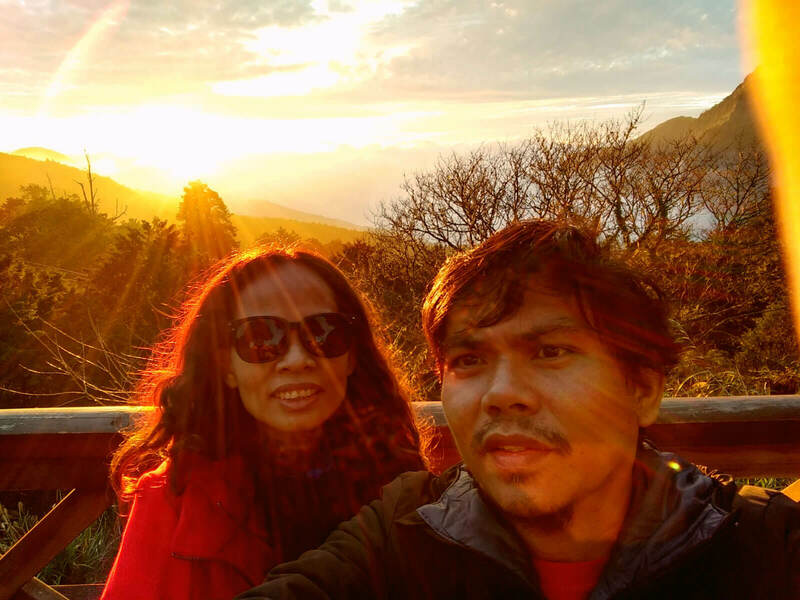 Whether for sunrise or sunset, Alishan is a selfie hotspot. WALKING TRAILS. 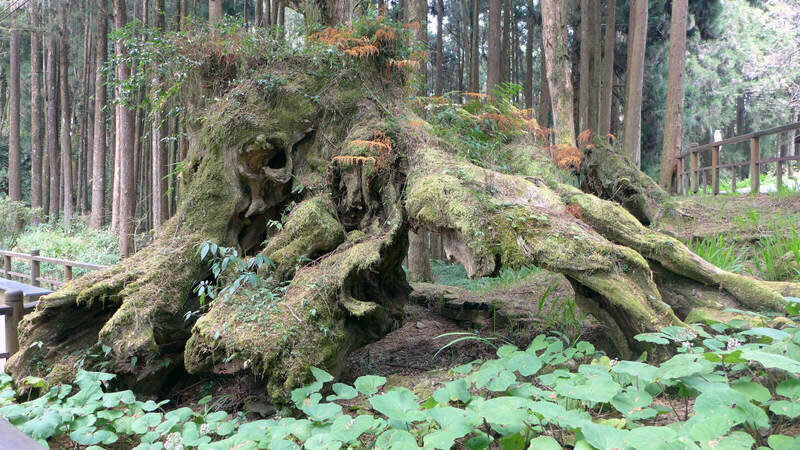 With well-built and maintained walkways, Alishan is a joy to hike, jog, or run. TRAIN TO SUNRISE VIEWING. Don’t let the few people in this photo fool you, this was the 2nd train after we failed to make through the packed station to ride the first. The visitor information center at the town.